If your idea of a winter holiday involves sport as well as snow, there’s always plenty going on in the resorts across Europe and America to cater for your needs. The famous Snowbombing Festival is a beguiling mix of fabulous scenery, hundreds of kilometres of ski slopes, and parties to be seen at! You don’t have to look too far afield to find anything from an igloo rave to a formal party, and many top international acts play there during the festival. 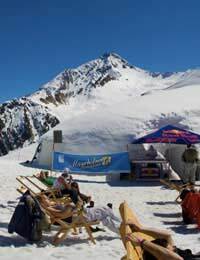 The Altitude Festival combines the best of three worlds - snowboarding, music and comedy. The chilled festivities are hosted by top comedians and the music is guaranteed to be great too. Freeze Festival, Battersea Power Station, LondonYou don’t have to leave the country to experience some frosty fun, just head to London. The annual Freeze Festival attracts some of the best snow boarders into the capital, where they can take part in a stunning display of aptitude in the exhibition contest. The Big Air Snowboarding and Freestyle Ski events all take place on a 100 meter long high jump ramp, just outside Battersea Power Station, using real snow, and the event is sound tracked by top music acts. The Brits Music and Winter Festival, LAAX, SwitzerlandThis week long festival offers skiing and music to suit all ages. You can choose to enter the snowboarding and skiing Open Championships in the valley slopes during the day, enjoy the slopes and then relax to music and other top quality entertainment when the lights go down. West Yellowstone Ski resort likes to enter into the thanksgiving spirit by putting on a fabulously festive, family-oriented skiing event, offering everything from beginners ski clinics to Pilates classes, indoor shows and demos by former Olympic skiers. The festival marks the start of the ski season every year and there’s always a great atmosphere. It’s definitely one for the family. TELUS World Ski and Snowboard Festival, Whistler, CanadaThe TELUS festival is one of the biggest gatherings for the skiing and boarding fraternity. The event has been running for fifteen years and it’s now customary for the month of April to host the ten-day festival that encompasses skiing and sports as well as music and the arts. Boarders can show off their skills at half pipe demonstrations, there are cross country ski races, glamorous fashion shows, and in the evenings the entertainment extends to all night parties and film showings. The Kiruna Snow Festival is a magical experience and an ideal way to see Lapland, the arctic circle and if you’re lucky, the Northern Lights. Make the most of the snow with snowmobile eventing, reindeer racing, parties, clubs and sports such as cross country skiing. It’s going to be cold though – the temperatures can drop as low as minus 20! Air and Style has moved on from being a simple snowboarding competition to a massive sporting festival that showcases a huge variety of extreme sports. After the day's exertions, visitors get to let their hair down to international music acts. The festival is sponsored by some major sports labels which means it gets bigger and more glamorous every year, and it’s perfect for young snow boarders who can cope with three days of partying on top of snowboarding action.